Why is Thuban being developed? [2001:] The FreeGIS Project provides an overview of Free Software GIS projects. Many valuable and highly sophisticated tools exist, but there is still a need for a user-friendly, interactive viewer for geographic information. 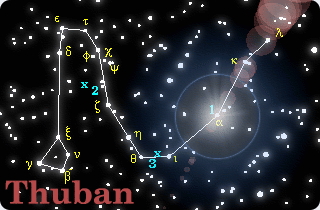 The project name Thuban originates from the alpha-star in the constellation Draco, the Dragon. It was the pole star when the Egyptians built the pyramids. Read this WikiPedia article for more about the Thuban the star. There is also a short german article on Thuban at WikiPedia. Bernhard Herzog <bh@intevation.de>: all major concepts, Table-Management, many features. Jonathan Coles <jonathan@intevation.de>: Legend, Classification, Projection-Management, GDAL-Support, documentation. Frank Koormann <frank@intevation.de>: Various small features, some extensions, fixes, documentation, web pages. Martin Müller <martin@intevation.de>: OGC Simple Features for SQL for PostGIS. Russel Nelson: Some small features. Markus Rechtien: SVG export extension. Bernhard Reiter <bernhard@intevation.de>: Conceptual ideas, various small fixes. Martin "Joey" Schulze: Major improvements of the WMS extension and some other small improvements. Jan Schüngel: UMN MapServer Management extension. Jan-Oliver Wagner <jan@intevation.de>: Various small features, some extensions, fixes, documentation, web pages. Ole Rahn: Major parts of the contributed PIROL extension. Silke Reimer <silke@intevation.de>: Debian maintainer for Thuban. The development of basic Thuban features has been part of the project "GREAT-ER II - Georeferenced Regional Exposure Asessment Tool for European Rivers", the successor of GREAT-ER 1.0. The GREAT-ER II project and the first phase of Thuban has been contracted as part of the CEFIC Long Range Research Initiative.